Outsell announced today that it was honored with two sought-after industry awards. 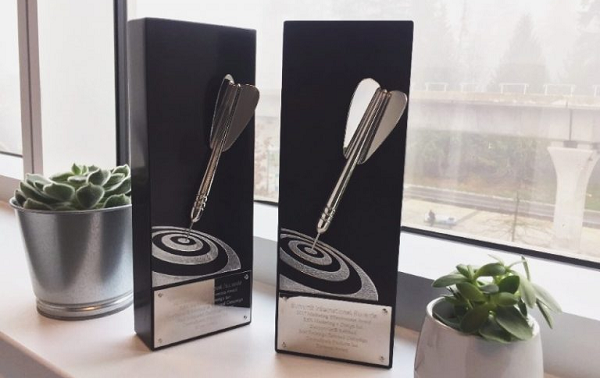 Outsell won the 2019 Automotive Website Awards (AWA) for Marketing Automation and with agency partner DSplus, was named the winner of the Summit Marketing Effectiveness Award (MEA) for the 2018 Toyota CH-R Launch Campaign powered by the Outsell platform. Brian Pasch of PCG Companies announced that Outsell won a 2019 AWA Award in the Marketing Automation category for their Outsell 5.2 platform. Outsell’s marketing automation platform driven by artificial intelligence increases customer engagement and drives more revenue by transforming how dealers engage with customers and prospects throughout their individual lifecycles. Outsell launched at NADA last month major update to its flagship platform. Outsell 5.2 includes new features that make it not only the best solution for managing and optimizing cross-channel marketing campaigns, but also greatly enhance auto marketers’ ability to create and share engaging content to increase customer retention and ultimately sales. The 2018 Toyota CH-R launch campaign was honored with a Summit MEA Platinum level award in the category Consumer Integrated Campaign. The campaign was designed to create awareness, encourage test drives and drive sales for 200+ participating Toyota dealerships throughout North America. The Summit Marketing Effectiveness competition recognizes marketing campaigns in 20 categories that change, influence, or reinforce a target audience’s knowledge, attitudes or beliefs. There were more than 1,400 submissions in this competition from 10 countries, approximately 9% of the entries were awarded and 3% received Platinum status. Outsell and DSplus devised a multi-step, individualized cross-tier marketing campaign that was central to the launch, and provided dealers with templates and directions, which meant very little work for the dealers. For several months prior to the launch, each dealer sent teaser emails regarding CH-R in order to gather behavioral data and measure interest in the new 2018 model. The results were impressive: more than 200,000 consumers interacted with the CH-R launch emails and microsite, moving thousands of CH-Rs off the lot for participating dealers, resulting in close to a million in sales. To view the award-winning campaign, visit 2018 Toyota CH-R Launch Campaign. Brian Pasch, President of PCG Companies, produces the Automotive Website Awards. This year, the AWAs took place on January 24th, 2019—the night prior to the start of the National Automotive Dealers Association Convention. The City Club of San Francisco hosted the award show which presented dozens of awards to the best website and technology products on the market for car dealers, and two individuals. For more information about all the winners of the AWAs, please visit http://awa.autos/. This US-based organization, pilots three separate awards – the Summit Creative Award, Summit Marketing Effectiveness Award, and the Summit Emerging Media Award. It is not tied to an advertiser, magazine, trade association, ad club or other outside influence. The Summit Awards is independent, and international in its scope, and focuses on identifying superior creative and effective marketing. It conducts impartial, ‘blind’ judging events and, once completed, recognizes, celebrates and promotes creative, effective marketing on behalf of winning companies and individuals. Its judging process is impartial and free from outside influences. It withholds both the names of the judges and entrants throughout the entire evaluation process. This anonymity shelters all involved from any vested interest that may attempt to influence the award’s outcome. To learn more, visit https://summitawards.com/marketing-effectiveness-award/about-mea/.